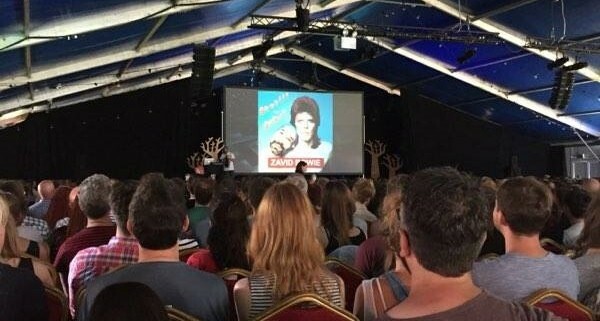 Adam Buxton returned to the Bristol Comedy Garden this year to present a special David Bowie version of his celebrated show BUG. The BFI-approved BUG show is essentially a platform for Buxton to discuss interesting music videos, a format which is made particularly hilarious by his reading out of bizarre Youtube comments. In choosing to devote a BUG show to Bowie, Buxton is taking a slight gamble. The idea will always be a popular one – Buxton has a devoted following, and Bowie is one of the superstars of the last century – but a fine line has to be trodden between celebrating Bowie as a musical icon and also recognising his wacky and often laughable behaviour. Fortunately, Buxton is clearly such a mega-fan that he is able to endearingly lampoon Bowie while also demonstrating utter love and devotion to his life’s work. Thus he can get away with lines like “I don’t think much of David Bowie’s latest phase…I much preferred his early alive work”. Buxton starts the show by riffing on the ludicrousness of sitting inside a tent watching a presentation on one of the hottest days of the year – “we’re going to be here for around four hours, so don’t get fainty”. He also reassures the crowd that he “won’t talk about Brexit”. The video for ‘The Jean Genie’ roars into life and Buxton asks the technicians to “kill the lights for maximum coolness”. Footage of Bowie requesting “tissues for my eyes” provides the first real laughs, while the music video for ‘Lazarus’, released on the day of his death, brings a tide of emotion. Each video – ‘Boys Keep Swinging’, ‘Loving the Alien’, ‘Ashes to Ashes’ and more – comes with interesting, detailed backstories by Buxton, who also finds time to playfully tease his hero. The trousers in Bowie’s famous billowed Kansai Yamamoto outfit are “very useful for festivals, they hold an amazing amount of urine”. Alternatives to his Aladdin Sane persona are offered – “Cobbler Bob”, “A Mad Deus” and “The Groovy Gardener” are all rejected. Elsewhere Buxton shows animations, dances on stage and recollects last year’s gig at Bristol Comedy Garden, where he was assaulted on stage by a woman who kept calling him “boring”. It’s all great fun, and at the same time brings the crowd together in a celebration of a significant life. It is difficult to think of a more appropriate way to look back on David Bowie’s work, and a more endearing and lovable presenter to lead us through it.